Our law firm has handled thousands of maritime injury claims for seamen located across the United States. We have recovered millions of dollars in compensation for people who have been injured at sea. Our practice is limited to handling maritime injury claims. It is what we do. It is all we do. 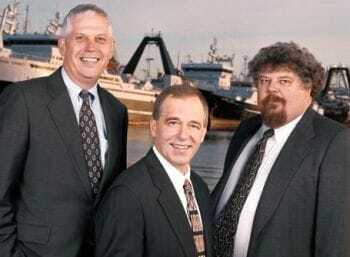 Stacey & Jacobsen, PLLC is the largest maritime personal injury firm in Oregon, Washington, and Alaska. We have the resources and experience necessary to take on the large shipping, tug boat, and fishing companies. There simply are not many types of accidents aboard a ship, tug, ferry, or fishing vessel that the Jones Act lawyers of Stacey & Jacobsen, PLLC have not handled before. We know where to find the expert testimony that it will take to prove your claims, and get you the compensation you deserve. If you have been injured at sea, please contact an attorney at Stacey and Jacobsen today for a free initial consultation and case evaluation, or call our Seattle office at 866-974-9633. The experienced maritime injury lawyers of Stacey & Jacobsen, PLLC have proven time and time again that they can obtain millions of dollars in compensation for their clients. While you may not have a million dollar maritime injury claim, you should have a lawyer with the skills necessary to handle such a claim. The same skills that we employ in million dollar cases can be used to obtain full and complete compensation for your injuries. Our maritime attorneys have obtained hundreds of six figure settlements for crewmen and passengers injured aboard ships, tugs, ferries, fishing boats, and passenger vessels. The bottom line is that if you have been injured aboard a ship, tug, or commercial fishing vessel, an experienced maritime and admiralty lawyer is more likely to get results for you than an inexperienced lawyer. How do you know which lawyers are experienced? Look at their jury verdicts. Look at how many million dollar maritime claims the firm has handled. How many maritime wrongful death claims has the firm handled? How many years have the firms been practicing maritime law? Have they previously handled injuries and accidents aboard vessels similar to yours? Is the firm practice limited to representing maritime injury victims? Clients retain Stacey & Jacobsen, PLLC on a contingency fee basis. Our law firm charges contingency fees similar to other attorneys across the country. In cases involving significant injuries in other states, we will work with you to adjust our fees so any travel costs to another state are minimized or eliminated. Although losses occur very rarely, if there is no recovery you do not have to pay any attorney fees to the firm.